Brownies are one of those perfect desserts: They’re gooey, they’re filled with chocolate flavor, and they definitely taste like a treat. But did you know that it’s possible to make a batch of brownies that not only tastes great, but that is actually pretty good for you too? I love to bake, and I love to make baked goods that can double both as dessert and breakfast. For me, there’s nothing quite as delicious as a slice of pie or a piece of cake right alongside my morning tea. But I enjoy eating that way a whole lot more when the baked good in question has a wholesome nutritional profile that will help me stay fueled throughout my day. And, if something can pass that test, then it means that I also feel entirely okay about serving it up to my three year old. I’m not saying that we eat dessert for breakfast every day, but it’s certainly a nice thing to do every once in a while! 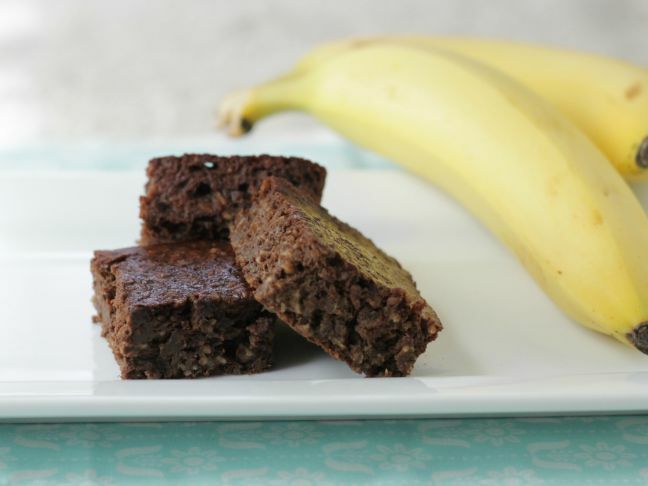 These banana brownies taste really great cold, and they last for days in the fridge, so you can make them on the weekend and serve them up as snacks, dessert, or yes, even a special breakfast, during the week. If you wrap them individually in plastic wrap once they are cooled and sliced, they make a nice addition to a packed school lunch. Their intense flavor comes from cocoa powder, rather than chocolate, which means that there’s minimal added sugars. And there’s moisture from very ripe bananas and a little natural sweetness to round things out from maple syrup. They pair extremely well with a glass of cold milk and would even make a great chocolate birthday cake if topped with a simple cream cheese frosting. The recipe comes together in the food processor, so there’s just one bowl to clean, and it bakes up in under thirty minutes. Which means that with minimal effort and time, you can offer your family a really delicious dessert any time you feel like it! The brownies are made with oats, so if you choose a gluten-free variety, those who can’t tolerate gluten can enjoy them too. My daughter and I shared a few with our gluten-free neighbor, and she was delighted. So no matter what the occasion—or whether you decide to share any—these brownies are a quick and easy treat that the whole family will love. Step 1: Preheat the oven to 350 degrees F and grease an 8 x 8 inch pan with nonstick spray. Place the oats in the bowl of a food processor and grind into a coarse flour. Step 2: Add the rest of the ingredients to the food processor and blend into a smooth batter, stopping to scrape down the sides of the bowl at least once. 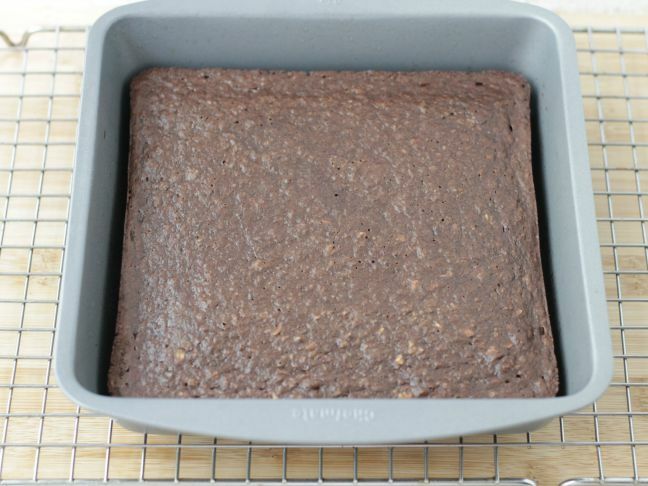 Pour into the prepared pan and bake for 23 to 25 minutes or until the brownies are firm in the center and a cake tester inserted in the center comes out clean. Let cool completely before serving. Serve at room temperature or chilled. 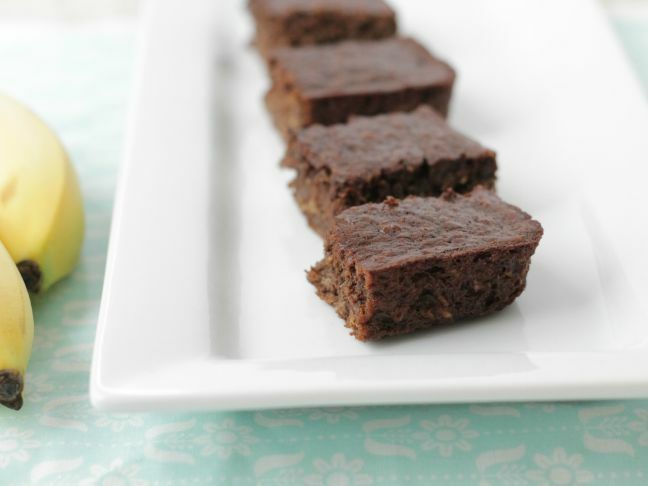 Make-Ahead: The brownies last for up to 5 days when kept in an airtight container in the fridge.